This article is about the Roman god. For other uses, see Mercury (disambiguation). A sculpture of the Roman god Mercury by seventeenth century Flemish artist Artus Quellinus. In Roman mythology, Mercury (IPA: /ˈmɜːkjəri/, Latin: Mercurius) was a major god of trade, profit, and commerce, the son of Maia Maiestas and Jupiter. His name is related to the Latin word merx ("merchandise"; compare merchant, commerce, etc.). In his earliest forms, he appears to have been related to the Etruscan deity Turms, but most of his characteristics and mythology were borrowed from the analogous Greek deity Hermes. Mercury has influenced the name of several objects in a variety of scientific fields, such as the planet Mercury, the element mercury, and the plant mercury. The word mercurial is commonly used to refer to something or someone erratic, volatile, or unstable, derived from Mercury's swift flights from place to place. Mercury did not appear among the indigenous gods of early Roman religion. Rather, he subsumed the earlier Dei Lucrii (early gods of wealth and trade) as Roman religion was syncretized with Greek religion during the time of the Roman Republic, starting around the third century B.C.E.. From the beginning, Mercury had essentially the same aspects as Hermes, wearing winged sandals (talaria) and a winged hat (petasos), and carrying the caduceus (a herald's staff with two entwined snakes that was Apollo's gift to Hermes). He was often accompanied by a cockerel, herald of the new day, a ram or goat, symbolizing fertility, and a tortoise, referring to Mercury's legendary invention of the lyre from a tortoise shell. Like Hermes, he was also a messenger of the gods and a god of trade, particularly of the grain trade. Mercury was also considered a god of abundance and commercial success, particularly in Gaul. He was also, like Hermes, the Romans' psychopomp, leading newly-deceased souls to the afterlife. Additionally, Ovid wrote that Mercury carried Morpheus's dreams from the valley of Somnus to sleeping humans. Mercury's temple in the Circus Maximus, between the Aventine and Palatine hills, was built in 495 B.C.E. This was a fitting place to worship a swift god of trade and travel, since it was a major center of commerce as well as a racetrack. Because it stood between the plebeian stronghold on the Aventine and the patrician center on the Palatine, it also emphasized the role of Mercury as a mediator. Since Mercury was not one of the early deities surviving from the Roman Kingdom, he was not assigned a flamen (priest), but he did have a major festival on May 15, the Mercuralia. During the Mercuralia, merchants sprinkled water from his sacred well near the Porta Capena on their heads. A three-headed image of a Celtic deity interpreted as Mercury and now believed to represent Lugus. When the Romans described the gods of Celtic and Germanic tribes, they interpreted them as local manifestations or aspects of their own gods rather than considering them separate deities, a cultural trait called the interpretatio Romana. Mercury, in particular, was reported as becoming extremely popular among the nations the Roman Empire conquered; Julius Caesar wrote of Mercury being the most popular god in Britain and Gaul, regarded as the inventor of all the arts. In Roman syncretism, Mercury was equated with the Celtic god Lugus, and in this aspect was commonly accompanied by the Celtic goddess Rosmerta. Although Lugus may originally have been a deity of light or the sun similar to the Roman Apollo (though this is disputed), his importance as a god of trade and commerce made him more akin to Mercury, and Apollo was instead equated with the Celtic deity Belenus. 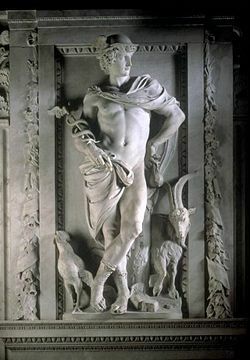 Mercury was also strongly associated with the Germanic god Wotan; first century Roman writer Tacitus identified the two as being the same, and described him as the chief god of the Germanic peoples. In Celtic areas, Mercury was sometimes portrayed with three heads or faces, and at Tongeren, Belgium, a statuette of Mercury with three phalli was found, with the extra two protruding from his head and replacing his nose; this was probably because the number three was considered magical, making such statues good luck and fertility charms. The Romans also made widespread use of small statues of Mercury, probably drawing from the ancient Greek tradition of hermae markers. In occult circles, Mercury is given primary rulership over things magical. This may be due in part to Mercury's association with Odin by way of the days of the week. Odin is the magical god, and also the head of the Norse pantheon. A Gaulish depiction of Mercury, now at the Carnavalet Museum in Paris. Mercurius Artaios, a combination of Mercury with the Celtic god Artaios, a deity of bears and hunting who was worshiped at Beaucroissant, France. Mercurius Arvernus, a combination of the Celtic Arvernus with Mercury. 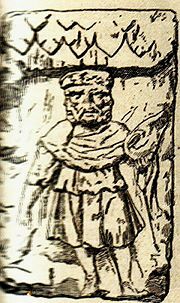 Arvernus was worshiped in the Rhineland, possibly as a particular deity of the Arverni tribe, though no dedications to Mercurius Arvernus occur in their territory in the Auvergne region of central France. Mercurius Cissonius, a combination of Mercury with the Celtic god Cissonius, who is written of in the area spanning from Cologne, Germany, to Saintes, France. Mercurius Esibraeus, a combination of the Iberian deity Esibraeus with Mercury. Esibraeus is mentioned only in an inscription found at Medelim, Portugal, and is possibly the same deity as Banda Isibraiegus, who is invoked in an inscription from the nearby village of Bemposta. Mercurius Gebrinius, a combination of Mercury with the Celtic or Germanic Gebrinius, known from an inscription on an altar in Bonn, Germany. Mercurius Moccus, from a Celtic god, Moccus, who was equated with Mercury, known from evidence at Langres, France. The name Moccus (pig) implies that this deity was connected to boar-hunting. Mercurius Visucius, a combination of the Celtic god Visucius with Mercury, attested in an inscription from Stuttgart, Germany. Visucius was worshiped primarily in the frontier area of the empire in Gaul and Germany. Although he was primarily associated with Mercury, Visucius was also sometimes linked to the Roman god Mars, as a dedicatory inscription to "Mars Visucius" and Visucia, Visicius's female counterpart, was found in Gaul. ↑ de Alarcão, Jorge, Roman Portugal. Volume I: Introduction (Warminster: Aris and Phillips, 1988.) p. 93.
de Alarcão, Jorge. Roman Portugal. Volume I: Introduction. Warminster: Aris and Phillips. 1988. Espérandieu, E. Recueil Général des Bas-relief, Statues et Bustes de la Germanie Romaine. Paris and Brussels. 1931. This page was last modified on 15 October 2014, at 23:30.